"பாட்டெழுதி பேர் வாங்கும் புலவர்கள் இருக்கிறார்கள். குற்றம் கண்டு பிடித்து பேர் வாங்கும் புலவர்களும் இருக்கிறார்கள்"
"There are poets who become famous by their own effort. And there are poets who just criticize others and become famous". But then the world owes much to artists whose claim to fame is only critiquing/commenting somebody's work. Take Mallinaatha for example, without his significant and monumental commentary it would be impossible to understand meghadhUtam or shishupaalavadha. So much so that Mallinaatha says "माघे मेघे वयम् गत:" (Life's gone in reading maaghakaavya and meghadhUtam). There are geniuses who create phenomental stuff and then we need mediators to such geniuses to expound it for us ordinary mortals. Or take Panini vs Patanjali. Panini's pataakhi-sounding pratyaahaara-s like ढक्, डुप्, दप्, घञ्, क्ङित्, तिप्, थस् sounds could only be expounded by a genius like Patanjali. We need a Hardy and several more, just to decipher us the genius of Ramanujan. Some cant stand that - like George Polya, the Hungarian mathematician who refused to get caught in Ramanujan's theorems, for the fear that he would spend his life just proving them, and never discover anything of his own. शिशुपालवध is no doubt one of the greatest mahakaavya-s. Among the pancha mahaakaavya-s it is considered the greatest. A famous subhaashitam says that माघ has the exceptional qualities of all three poets कालिदास, भारवि and दण्डिन्. Think about shishupaala for a moment. Forget that he is a villain, thats a simplistic view. 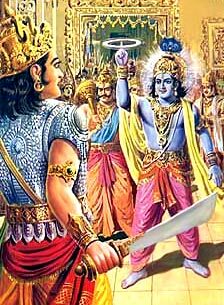 He consistently challenged Krishna's superiority, for whatever reasons. He showed scant respect for Krishna, repeatedly insulted him and asked others during the raajasUya-yajna "Isn't there one person who is worthy of honor than this shepherd?". People like shishupaala are not incidental, and are not coy to challenge superiority, no matter who it is. Similarly, Nakkeeran challenged the poem of Dharumi. From Dharumi's point of view, Nakkeeran criticized him. But Nakkeeran challenged the poem, the one written by Lord Shiva himself. The greatness of art is strengthened only if it can withstand any challenges. So it is only natural someone challenged the superiority of Maaghakaavya. And such a challenger was Vadiraja Tirtha. Like several Sanskritam literature works, this one too is hardly heard of, except in a few elite circles. I had earlier mentioned that it is only our loss not savoring the Sanskritam language of scriptural literature. There appears to be a lot of noise around "secular" Sanskritam literature, whatever that means, side-lining the beauty of the language shining in other fields. The verses are very simple and pretty straight-forward to understand. "Once in पुण्यपुरी (modern Pune), the best of kaavya namely Maghakaavya was about to be honored on elephant's head. Hearing this, Vadiraja said to the scholars there "Before you honor the kaavya, listen to one kaavyaa written in our place. If some time is given, I will show you and you can verify it yourself. 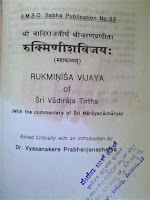 Vadiraja wrote one sarga per day for the next 19 days and completed the work rukmiNIsha vijaya ("The Victory of Lord of Rukmini"). The scholars read and were stunned and filled with joy. They declared रुक्मिणीश विजय to be better than माघकाव्य. They declared Vadiraja as a "tilaka" (foremost) among the poetic society." 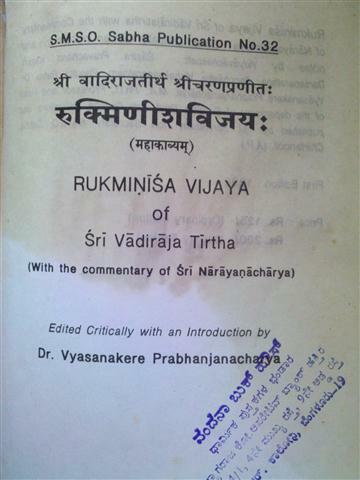 An important contention of Vadiraja was that the title of the book is about "killing" shishupala and invokes negative thoughts, while Rukminisha vijaya is about the "victory" of Krishna, which evokes positive feelings. The name of the kavya itself is mangala. One cannot argue with that point though. Replete with अलङ्कार, अनुप्रास, यमक, चित्रपद, a variety of छन्दस् and lot more that a tiny mind like mine cannot comprehend, Rukminisha Vijaya is as delightful to read as shishupaalavadha.
" सम्मन्य प्रार्चयत् कविसत्तमम्" इत्येतत् नावगतं। अपरं च 'प्रास' इत्युक्ते किं? महामेधावी वादीराजतीर्थः विजयनगरान्तं दृष्टवान् स्यात्, तदनन्तरं कस्मिन् राज्ये अवसत् - portuguese संस्थाने वा? Must be sammaanya - ityuke maanyam (gift) dattvaa apUjayat | praasa - must be anupraasa - alliteration. Yes Vadiraja did see the end of Vijayanagara, after that he went back to Sode/Sonde. His brindavana is there. I do not know if Polya ever escaped Ramanujan in his life as he did do some work on Rogers-Ramanujan Identities (which I think he taught at ETH, Zurich in private, as Polya mostly instructed in Mathematical Physics there to an audience as wide as forest officials). This is from the Introduction to Polya's Collected Works, edited by Gian-carlo Rota, MIT Press. There's an interesting anecdote about Hardy and Polya. Hardy was aware of Polya's likening of a problem solver (in How to Solve It) to a mouse hitting the cage repeatedly to break it open. While visiting a zoo in Zurich, Hardy in the presence of Polya saw a bear pawing its way through the cage, but couldn't. The witty Hardy lipped: "He is like Polya! He has excellent ideas, but does not carry them out!" Polya himself wrote this in his Picture Album, Birkhauser Boston: 1987 page 89. I knew that as an anecdote long ago. I cannot recollect if I read that in the Man who knew infinity book. But I did search and find a reference in google books before posting the blog. Searching for Polya and Ramanujan yields couple more references as well.